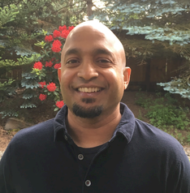 Anand “Ani” Jayakaran is an Associate Professor in the College of Agriculture, Human, and Natural Resource Sciences–Washington State University Extension. Ani has a BS in Civil Engineering from India, an MS in Civil Engineering and a PhD in Agricultural & Biological Engineering from Ohio State University. He was previously tenured-faculty at Clemson University’s Baruch institute of Coastal Ecology and Forest Science in South Carolina. He is a licensed Civil Engineering in the states of Washington and South Carolina. Ani’s role is to provide extension and research needs throughout the state of Washington and involves disseminating strategies to manage water resources using Low Impact Development and improving current engineering designs with ecosystems-centric solutions for handling stormwater through applied research. Ani’s areas of academic interest are green infrastructure, best management practices (BMP), watershed hydrology and fluvial geomorphology, specifically with respect to improving stormwater infrastructure in watersheds impacted by urbanization.